Last week, at an Applebees Restaurant in St Louis, a pastor with a party of 7 people ate and left without leaving a tip. It was an unhappy reaction to the automatic 18% gratuity slapped on all groups numbering 6 or more people. What made it worse was the comments written on it. "I give God 10% Why do you get 18" and signed by name with a clear "Pastor" designation besides it. Upset, another waitress snapped a photo of the receipt and posted it online. The pastor got embarrassed. One waitress got fired. The "Christian" name got slammed. The media got wind of this and soon, people were up in arms against the pastor's action and the restaurant's reaction. Questions continue to be asked. Why did the pastor use God's Name in venting out her disagreement over the tipping amount? Why did the restaurant management fire the worker instead of giving her a second chance? Should not the restaurant be more sympathetic to the worker, and see the bigger picture, that the posting is done out of a frustration and feeling of injustice done? Why the big furor over this incident? If there is privacy concerns, isn't any giving ought to be in secret in the first place? The episode has garnered lots of responses on the Internet. Just do a search and you will see lots of material on it, mostly negative. In a culture already flushed with negative images of the church, Christians, and evangelicals, the news jabs the dagger of negative perceptions a few inches deeper into the image of the Church. One particular post is particularly disturbing. 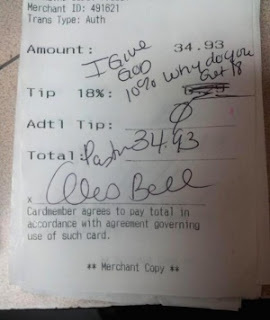 In "Why are Christians Such Bad Tippers?" Karen Swallow Prior makes a case for at least 15% tip amount as a way to love our neighbour. In that article, Christians apparently have a bad reputation. Sunday lunch times are times that restaurant servers dread. After church services, the Christians come in big groups, hog big tables, demand lots of attention, and at the end of it all, tip poorly. In short, who wants to work so hard at a frenetic pace, and at the end of it all, receive a poor tip. Worse, if the tip is too small, servers may even need to dig into their own pockets to fill up the common tip pool for the rest of the staff! What is most troubling is what Prior says, "bad theology." I agree. When Christians separate their own lifestyles according to the sacred-secular distinctions, they are practicing Gnosticism. In a nutshell, Gnosticism is a belief that essentially says the sacred is good and the secular is bad. The physical is evil and the spirit is good. The body is bad while the soul is good. Likewise, they apply this Gnostic influence into their giving. Giving to God is good, and giving to others is bad. This explains in a big way why the St Louis pastor writes, "I give God 10% Why do you get 18." Learning: Poor theology leads to poor living. Personally, I do not like the whole idea of tipping. I have lived in countries where tipping is generally forbidden, and if need be, a service charge be added to the whole bill. While it is taking away the decision making away from the customer, it essentially pays for the restaurant overheads. For me, it is far easier and transparent to simply pay for what we eat, assured that the servers, the waiters, the chefs, and all other restaurant staff already have their basic pay met by the restaurant management. Unfortunately, customers bear the brunt of the costs. In North America, it is a different story. Tipping is a major part of eating out. Many visitors are quite unaware and misinformed about tipping altogether. Before even talking about how much they should tip, they cannot even understand why they must tip in the first place! It takes a while to understand the tipping culture. During my first visit to America many years ago, my friends constantly remind me to tip adequately or never go back to that restaurant. I will be "blacklisted," they say, meaning that they can either deny me service next time, or promise me nasty treatment if I do go back. For a small group, the tip column is usually left blank on the receipt so that the customer can decide how much to give. For larger groups, usually 6 or more, a standard tip rate will be applied automatically. It is this automatic insertion that irks many people, especially those who like the freedom to decide how much to give or not to give. Sometimes, arguments can happen. Only after living in North America, I get to appreciate how important tipping is to restaurant staff. When customers wield their miserly pen over the tipping line, the servers and the restaurant staff bear the brunt. Learning: Blame the System but Don't Penalize People. C) How Much Tip is Enough? I asked a friend who works in a local restaurant, and she says that the minimum tip in Vancouver is 10%. Anything less will be bad for staff. A good tip will be 20%. I understand too from another restaurant insider, that sometimes servers are bullied by the kitchen staff if the tip amount is too low. Suppose the acceptable tip is 10%. If a customer leaves only a 5% tip, the server will be forced to cough up the other 5% for the common pool. For large groups with a large bill, this can be pretty substantial. It is altogether a terrible business model. Why must restaurants push all the responsibility to the paying customer? Why must it be "industry practice" to have restaurant management not pay their own staff well enough? Why must the tipping system be so essential to the basic survival of restaurant workers? Alas, it is a no-win situation. If the restaurants pay all their staff well, and remove the reliance of staff on the gratuity component, the menu prices of the food will rise. The number of customers come down, and soon the restaurant will need to lay off staff. That's not good. If the restaurant pay their staff at the minimum wage, and makes them depend heavily on tipping, the staff becomes dependent on the wide range of customer tipping amounts. Good tippers help them stay afloat. Bad tippers sink them, financially and emotionally. That's not good. For Christians who come in droves, make big demands on the serving staff, and then leave behind a bad tip, they create a bad name not just for themselves, but also the Church and the name of Christianity at large. That's also not good. I struggle with this when I was a student. I stuck to a maximum of 10%. Sometimes, when I rounded up the total, it fell to about 9%. I justified myself as a 'poor' student. Over the years, as I understand the tipping system, my tipping has risen to about 12-18%, regardless of how I have been served. Sometimes, we think that tipping is a way to recognize the quality of service. I beg to differ. We tip not on the basis of how well we are served. 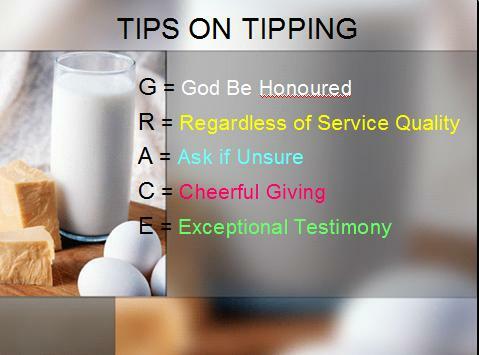 We tip on the basis of honouring God, by loving our server. No one likes to be shortchanged. We all should be responsible citizens and neighbours to honour hard work, thrift, and fair treatment of people. In fact, when Christians tip well, it reflects the grace that we have received from God. For if God has forgiven us in the amount of billions of dollars, why can't we extend the grace to others, in the form of a few dollars more? Learning: Tipping is an act of Grace. I like to use the acronym GRACE as a way to represent the principle of our giving as Christians. Scriptures call us to honour God in all things. Whatever we do, we do it in the name of Christ, through thanksgiving to God for what He had done in our lives (Col 3:17). Our act of giving must reflect the receiving of much grace and goodness from God. Be consistent in our honouring God. Do not make a distinction between our lives inside and outside the Church. When we want to honour God, we honour God everywhere we go, not just inside the Church. When we tip, we must let it be part of our efforts to respect our servers. They too have rent to pay, bills to deal with, families to feed. They are just doing their jobs. They are sandwiched between a cruel cost-cutting management and a budget conscious customer. Tip in a manner that shows respect to the servers, as if they are our neighbours. Simply put, just because they do not serve up to our personal standards, does not mean we to not tip. You do not have to tip high. Tip respectably. Tip in a manner that demonstrates the grace we have received from God. This is particularly important if we travel to another state or province where the tipping rates are different. The rule of thumb is easy. If unsure, just ask the server and the server can easily give an average. I've asked before, and the general response is relief and frank honesty about what is fair. In fact, when we ask, we put the server at ease, and they will appreciate being treated well as a human person. Here is where theology is important. We need to be consistent in our giving. Loving God more does not mean we must love people less. Love God. Love people. For if we truly love God, we will know that God loves people as much. Likewise, when we claim to treat God well, and cheerfully give to God, why should we treat our fellow humans any different? Every time Christians enter a restaurant, the general perception is that they tip poorly and are bad testimonies. Maybe, this episode is an opportunity to reverse the trend. Christians can be a powerful influence on the rest of society. Christians can buck the trend. They can do something good out of something that is perceived bad. I believe there is a chance. When more Christians are educated, and more of them understand the tipping system, and how important it is to be part of our practicing of good theology, there is a great chance for an exceptional testimony. One last thing. I am sure there will still be questions about tipping. At the same time, some people may still continue to struggle with the whole tipping system. Here is my advice. If you want to eat out, for the sake of Christ, tip well. If you do not want to tip well, do not eat out. When we tip well, it reflects a big heart.